Chris McGrath/Getty ImagesProtesters calling for Khashoggi’s freedom outside the Saudi consulate in Istanbul on Monday. 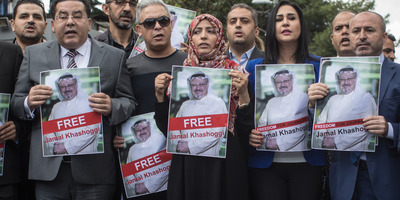 Khaled Saffuri, a friend of missing Saudi critic and journalist Jamal Khashoggi, said the Saudi regime likely killed him. Trump has expressed his concern over the Khashoggi case but said he would not halt arms sales to Saudi Arabia over it. Saffuri’s remarks came as Turkey claimed to have audio and video footage of Khashoggi being killed during his visit to the Saudi consulate. A close friend of Jamal Khashoggi, the Saudi critic and journalist who went missing under his country’s watch last week, said that his friend was likely killed because Saudi Arabia’s leadership was encouraged by Donald Trump’s anti-media rhetoric. 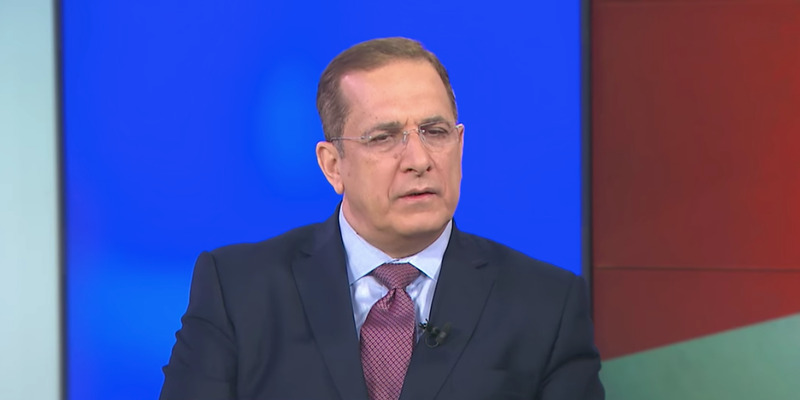 Khaled Saffuri, a Washington, DC-based political analyst, told the Yahoo News podcast “Skullduggery” this week that the Saudi leadership was likely angered by his friend’s critical columns in The Washington Post, and killed him for it. Khashoggi, 59, entered the Saudi consulate in Istanbul on October 2 and has not been seen since. CGTN America/YouTubeKhaled Saffuri at a TV appearance in May 2018. In the podcast episode, which came out on Friday, Saffuri said that Trump’s “rhetoric against journalists probably encouraged the Saudis to” kill Khashoggi. You can hear him discuss all this from the 18:05 mark in this link. The remarks came as Turkey claimed to have audio and video footage of Khashoggi being killed during his visit to the Saudi consulate. A Washington Post report published on Thursday cited multiple unnamed Turkish and US officials, including one the Post said described audio indicating that a team of Saudis “interrogated, tortured, and then murdered” Khashoggi. The officials also reportedly said that Khashoggi’s body was dismembered after his death. Saudi officials, including Crown Prince Mohammed bin Salman, have repeatedly denied knowledge of the case and insisted that Khashoggi left the consulate. Trump has expressed its concern over Khashoggi’s disappearance, but have appeared loath to take any big actions. The US president told reporters this week that he opposed halting arms sales to Saudi Arabia over Khashoggi’s disappearance, having previously touted the weapons deal as an achievement of his improved ties with the Saudi monarchy. Getty ImagesTrump and Saudi Crown Prince Mohammed bin Salman at the White House earlier this year. 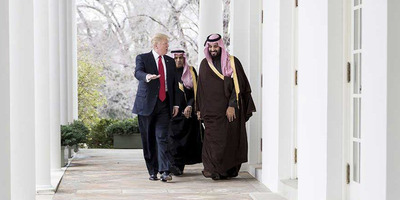 “He thinks of Saudi Arabia as a piggy bank as he can get money and create jobs in the US,” Saffuri added. She told Business Insider that Turkey likely wanted US assistance to stand up to Saudi Arabia over the Khashoggi crisis, but has not received the response it expected. “Turkey will probably be quite frustrated that the US seems to have stepped down from its position for trying to uphold the liberal international order, where it’s not OK to target journalists,” she said. A group of bipartisan senators on Wednesday urged Trump to identify and hold accountable those responsible for Khashoggi’s disappearance by imposing sanctions on those responsible via the Global Magnitsky Human Rights Accountability Act. Dennis Ross, a former US diplomat in the Middle East, also called on Trump to enact the sanctions in a Washington Post op-ed on Thursday.